The founder of BIMEHC, Pa Tumenta Matthias Wambo (1935-2009), started in 1959 treating his first patients traditionally with herbs. People came to seek his help for their physical and mental complaints. Pa Matthias developed himself as a specialist in treating mental illnesses. Within a few years, medical doctors from Banso, Bamenda, Douala and Yaounde started referring psychiatric patients to him and vice versa. In the late seventies the number of patients was increasing. Some of them needed long term treatment and preferred to stay in Pa’s compound. He borrowed houses from his family to accommodate the patients, some built their own grass huts. When his name and successful treatment was getting known, people from different places (national and international) came to seek his help. More huts and houses were built for and by the patients. The patients started a prayer group. The children in the quarter and the patients were getting informal teaching under a tree. A church was set up for multiple purposes (choir, masses, school, community room etc.) Every month a doctor came to consult the patients with psychical complaints. Well wishers helped to built a school in1986, the Catholic Mission provided teachers. In 1984 Pa Matthias noted that a lot of patients were presenting all different kind of complaints while he thought is origin derived from the same illness. He stated in his notebook that “something was eating the body from the inside...and that is was going to affect a lot of Africans”. It turned out that those patients were HIV positive but that knowledge had not yet reached the interior of most African countries. Pa realised it affected mental health in a direct and indirect way. 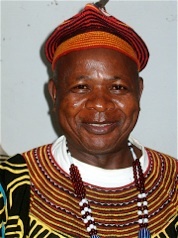 Pa Matthias was granted recognision in 1989 as Traditional Doctor and became a member of the Cameroon Traditional Doctors Union and was also recognised as first aid and traditional birth attendant. Formally, he transferred the patient to the nearest health centre or hospital, but when petrol prices were going up and the increasing number of patients coming to the Home, there was need to extend the basic care. Many patients did not have any money to pay for treatment. Some of them were abandoned by their family and built up their life in the Home. In 2001 his son Tweke John Tumenta finished his community nursing education and he returned to Mbenjeh. The Charity Health Foundation (registration № LT/GP/30/01/3399) took the traditional home as an annex to carry out primary health care activities with modern medication. In May 2003, the first international partnerships were established and volunteers started sharing their knowledge. The home was registered as a Common Initiative Group in May 2004 with registration № NW 30/04/8492 with the name Babungo Integrated Health Care (BIHC). In 2004 the local community donated a piece of land and the construction of the new centre started. The new community hall was built first and functioned as a temporary Primary Health Care unit. In 2006 appropriate accommodation was built for the psychiatric patients and their obligatory carers. Every patient was entitled to room with two beds. Gradually the new site developed itself into an integrated health centre with income generating activities (piggery, poultry, tailoring and agriculture) and also a focus on education. In 2008 some Dutch visitors were moved by the development of the centre and the living conditions of the local population and decided to create the Babungo Foundation (Stichting Babungo) with the aim to support BIMEHC and educational programmes for underprivileged children in Babungo and Yaoundé. In 2009 a collaboration was established with Psychiatric Hospital Centre Jamot in Yaounde. Psychiatrist Dr. Jean Pierre Olen Kamga took a keen interest in the centre and started voluntarily visiting the centre every month - until date - to consult patients and to build the capacity of the staff. 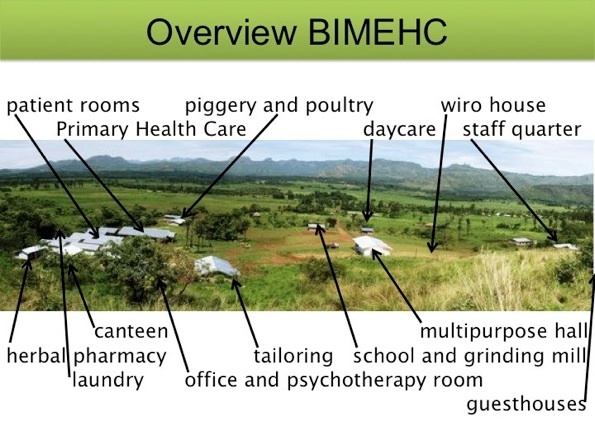 In November 2012 BIMEHC got its certificate of incorporation (ref. №.RC.NDP2012.A.0012).